Music by Mr. Death, graphics and code by Mermaid, moral support and testing by Hedning. Works on NTSC and PAL. Yo-ho-ho, and a bottle of rum ! absolutely sweet! love the music, too! jay! me like as well. yuhuu, ship o hoy captain! Eh, ok. Good sid and looks decent but utterly boring. Not my taste, sorry. Was utterly epic on the bigscreen. Nothing pretentious: Just a nice little prod with nice and fresh gfx and a cool tune. rulez added on the 2012-06-12 05:04:13 by ɧ4ɾɗվ. Haha, this is good. Music could be a bit more varying but it works for the purpose. 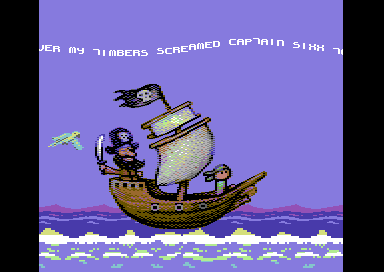 Shiver me timbers, this is so cool! Sprite animation is so rare these days! Usual Mermaid stuff: Cute and fresh. Best non-interactive adventure game ever. Nice cartoon story. And well painted. page created in 0.022553 seconds with 15 queries.